An artist’s rendering of Puma’s proposed headquarters at Assembly Row in Somerville. Puma is building a new North American headquarters in Somerville. The sneaker maker said Thursday that it has signed a lease to occupy the majority of an office building being built at Assembly Row, making it the latest major company — including several of its shoemaking rivals — to consolidate operations in the core of Greater Boston. When the building opens in 2021, Puma North America will have approximately 550 employees there. It plans to combine its downtown Boston design and marketing center with sales, operations, and corporate offices that are now located in Westford, and add about 100 new hires at the Somerville headquarters. Like Sanofi Genzyme, Rapid7, and John Hancock, which have lately announced similar consolidations, Puma is aiming to boost collaboration by putting all its people under one roof, North American president Bob Philion said. He said the company wanted to locate in a place where it could better tap the large pool of younger workers in and around Boston. The move will also increase Puma’s visibility. Its offices are now split between a suburban office park and the top floor of the Government Center Garage (though the Boston office employees will soon relocate to a downtown WeWork). 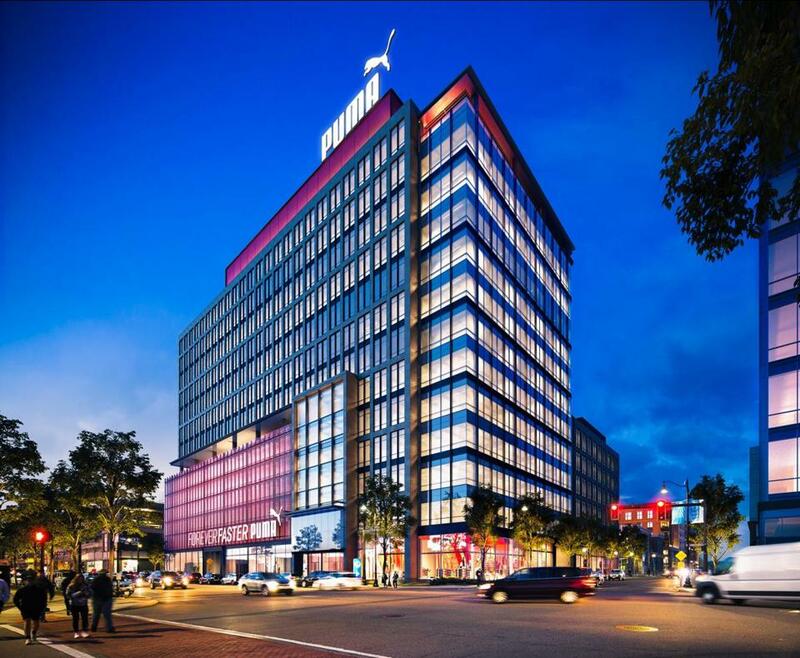 At the new building in Somerville, pending city approvals, Puma will be able to have a large sign that can be seen from Interstate 93, street-level amenities at the busy Assembly Row shopping center, and maybe an outdoor basketball court. It also plans to step up community engagement in Boston, chief marketing officer Adam Petrick said. Puma looked at sites in Westford, Boston, and elsewhere in the region before settling on a long-term lease for 150,000 square feet at Assembly Row. Asked why, Philion cited its location — on Interstate 93 North and the MBTA’s Orange Line — as being convenient for the company’s current and future workforce. He also mentioned the mixed-use nature of what has become one of the region’s busiest retail centers with a major housing development, hotels, and restaurants. Several rivals have already made a similar jump. Converse moved its headquarters from North Andover to a rehabbed building near North Station in 2015, while Reebok last year came to the Seaport from Canton. New Balance, too, has built a massive campus around its headquarters in Brighton, drawing practice facilities for both the Bruins and Celtics and a variety of office tenants. Sites such as New Balance’s Boston Landing campus and Assembly Row are proving especially popular with companies that want to recruit and retain workers from the city and suburbs, said Mike Joyce, a broker at real estate firm Cushman & Wakefield. “A lot of companies are trying to bring all their bright minds together,” said Joyce, who represented Puma in the deal. The company will be the second major office tenant at Assembly Row, which in 2013 beat out Boston sites to land a large Partners Healthcare office with about 4,000 employees. Developer Federal Realty Investment Trust also built, and filled, a 100,000-square-foot office building there, and has another 100,000 square feet to lease in the building Puma will occupy. Beyond that, the developer is permitted for another 1.5 million square feet of office space, which it is marketing with an eye to tech and life science companies looking to grow out of increasingly crowded Cambridge. Amazon also toured the complex last year in its search for a second headquarters. Developers focused first on retail and housing at the 45-acre site, believing that will make it more attractive for the next phase of office development, said Patrick McMahon, who is leading the project for Federal Realty Investment Trust. Somerville Mayor Joe Curtatone hopes this is the start of a surge in office development. At Assembly Row and in planning a major redevelopment of Union Square, the city has put a premium on office development, hoping to bring jobs to Somerville and boost the city’s commercial tax base.